Nicolas Simon (also known as Simon Fr.) is a superb maker whose life and origins are still poorly documented. All we can say with certainty is that he made exceptional bows broadly in the style of Peccatte. This is a very fine bow by an intriguing maker, equal in all respects to a good Dominique Peccatte. It follows the same approach to construction, the metal underslide with iron screws being the chief departure from the work of Tourte and Persoit. The strong angle to the front of the head is also very reminsicent of Peccatte, but the chamfers are narrower and the frog more compact and elegant. The stick is of round section dark red pernambuco, mounts are silver and ebony. The condition of this bow is excellent with just a few dents here and there. There is an original very fine shaving laid into the stick, presumably covering a blemish in the wood. This is quite common on bows of this period. Overall this is an outstanding example of this maker’s work. I fell for this bow from the first stroke. It has an exceptional range, moving from velvety soft to screaming and aggressive in the blink of an eye. It’s a powerful stick but not rigid – to me it seems supremely controllable and just perfectly balanced. Soundwise it’s quite coloured, and there’s a roundness in the tone that you would struggle to find in a Sartory. 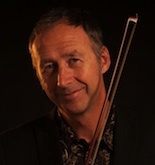 The wonderful bows of the early 19th century aren’t for everybody – many players look for a brasher or grittier sound. But if you are looking for an enormous tonal pallette and range of strokes rather than just a tentpole to bash out Shostakovitch, this bow is a hard act to follow. We don’t come across many bows of this calibre – the last I can think of was an unusually good Persoit, nearly four times the price. 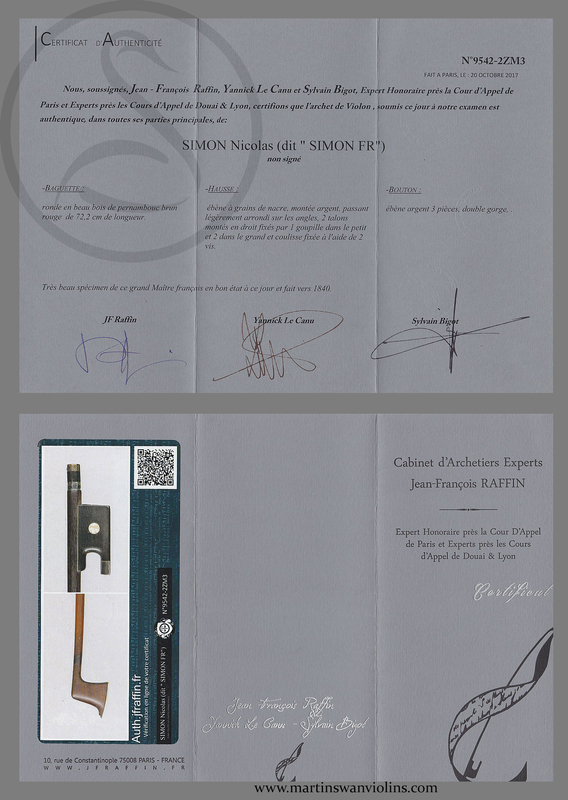 Interested in this Nicolas Simon Violin Bow? Look at our other rare violin bows.